Foodborne illness has a major impact on health and the economy in the United States. According to the most recent data from the Centers for Disease Control and Prevention (CDC), every year one out of six Americans gets sick from food, resulting in 125,000 hospitalizations and 3,000 deaths. About 20% of cases can be traced to an ill food worker. Elderly people are particularly vulnerable to foodborne illnesses such a norovirus, especially in group living settings such as nursing homes. The CDC estimates there are more than 21 million annual cases of norovirus, and half of all cases of foodborne illness in the U.S. can be attributed to norovirus infection. Norovirus symptoms include vomiting, diarrhea, cramping and fever. Infected people usually feel better after one or two days, but they may be contagious for as long as two weeks. Norovirus is especially difficult to kill and easy to transmit. Of the cases analyzed by the CDC from July 1997 to June 2000, 57% were caused by food, which most often became contaminated by an infected food handler immediately prior to consumption. Thirty-six percent of cases were traced to restaurants and catered meals, 23% to nursing homes, 13% to schools, and 10% to cruise ships. The CDC advises that the measures most likely to significantly reduce the incidence of norovirus are correct handling of cold foods, frequent hand washing and provision of paid sick leave. In Washington state, all food service workers are required to take food safety training and are prohibited from working around unpackaged food or beverages if they have symptoms of gastrointestinal disease or have been diagnosed with a disease that can be transmitted through food. However, since most restaurants do not offer paid sick time, ill employees are forced to choose between taking unpaid leave or going to work sick. A recent survey of food service workers reported in the Journal of Food Protection found that 19.8% had worked while experiencing vomiting or diarrhea in the past year. Another survey of over 4,300 restaurant workers in 8 metropolitan regions of the U.S. found that 88% did not receive paid sick time and 63% had worked serving or preparing food while sick. 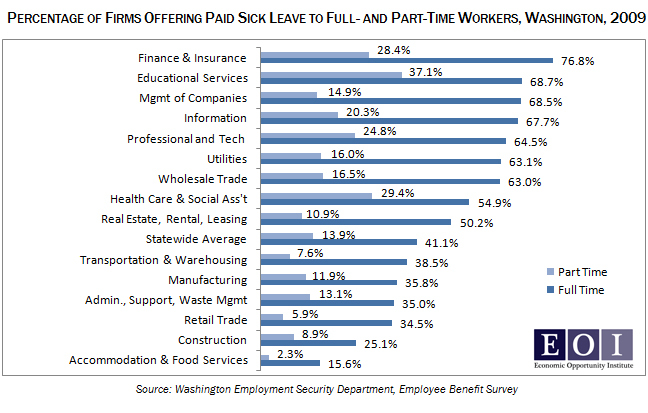 Some workers who do earn paid sick leave face obstacles in using it. Some employer policies, including in some area grocery stores and hospitals, do not allow use of paid leave until workers have been off two or three days without pay. In addition, employees may face disciplinary measures if they call in sick, with too many absences resulting in job loss, even when an illness is well documented. This entry was posted in Healthy workers, Paid sick days and tagged foodborne illness, norovirus, Paid sick days, paid sick leave. Bookmark the permalink.